When a hurricane moves through Sarasota, FL, are you prepared to batten down the hatches to avoid damage from the storm? The weather in the coastal regions of Florida is pleasant for most of the year, but residents sometimes deal with the risk of potential property damage during a hurricane. Here at Armored Dade Windows & Shutters, we offer a variety of hurricane shutters and windows to protect your home. We invite you to learn more about the benefits of these products so you can consider making the investment before a hurricane comes to the area. Proactive work now can be the best way to avoid damage in the future. 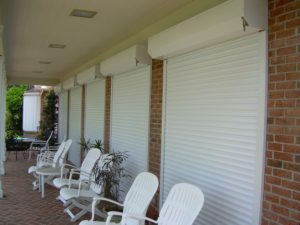 What are the Advantages of Hurricane Shutters? Installing high-quality hurricane shutters on your home can decrease potential damage during a storm. These shutters will cover windows and doors to keep your family and property protected. The right strategy to secure your home could even save your life! During a hurricane, it is common for debris to fly through the air because of high winds. If an object comes into contact with the glass on your window, it could potentially shatter the glass and allow the storm to rage through your living space. Covering the windows with hurricane shutters can keep your home protected so you can avoid potential structural damage that can occur if the windows are breached. Why Do Broken Windows Cause Structural Damage? If a window or door breaks in a hurricane, it creates a weak point in the home that could lead to additional damage. High-quality windows will keep your home sealed away from the storm, keeping the wind and rain out of your living areas. A broken window creates an opening for the wind. As the wind moves into the building, it needs somewhere to go. The most common pattern is for the wind to move inside and up. As the air pressure changes inside, it puts strong forces on the overall structure of the building. The air can stress the roof and even cause the roof to come off the house if the conditions are right. Broken windows are just the beginning of a domino effect that damages the rest of the home. The best way to keep a solid line of defense against these structural problems is to cover the windows with sturdy storm shutters. What Style of Storm Shutters Do You Need? When you decide to install storm shutters on your home in Sarasota, FL, you will need to choose the style and design that matches your preferences. Here at Armored Dade Windows & Shutters, we offer all of the window coverings you need for storm protection. Storm Panels: These products offer the cheapest way to keep your windows protected. They don’t offer the same convenience available in other styles, but they are a low-cost way to cover the windows in a simple manner. Roll Down Shutters: This design style offers both beauty and strength, giving you a simple way to cover the windows. If you want to protect your windows in a stylish way, you might consider the advantages of the roll down design. You can choose manual shutters that roll open when you move them. Or there are electric controls that offer the ease of opening and closing the shutters with the touch of a button. Bahama Shutters: Like some of the other designs, these shutters are permanently attached to the outside of your home. The shutters are affordable since they are made in one piece. The structure is connected at the top of the window, with a small prop at the bottom if you want to let in the light. Accordion Shutters: Another cost-effective way to cover windows is with an accordion design. You can open the shutters and they move in an accordion style to the side of the window frame. If the shutters are open, they are barely noticeable, giving you the full view. You can slide the shutters to the side any time you want to open or close the windows. How do you decide the best style of hurricane shutters for your home in Sarasota, FL? The best thing you can do is talk to a windows expert and learn more about the advantages of each design. Our expert team will assess your home and make recommendations based on your needs. At Armored Dade Windows & Shutters, we are dedicated to the satisfaction of each of our customers. We have a stylish showroom where you can see the shutter options at 8112 Cortez Rd W Bradenton, FL 34210. Call anytime and we will gladly schedule an appointment to provide a free estimate for your home: (941) 798-9010.